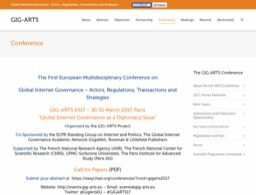 GIG-ARTS 2017 is The First European Multidisciplinary Conference on Global Internet Governance – Actors, Regulations, Transactions and Strategies, one of the outcomes of the GIG-ARTS project (www.gig-arts.eu). In addition to general global Internet governance topics, including comparative approaches with other global governance studies fields, GIG-ARTS 2017 particularly welcomes submissions on this year's theme: “Global Internet Governance as a Diplomacy Issue”. Abstracts no longer than 500 words should be submitted at https://easychair.org/conferences/?conf=gigarts2017, by 31 October 2016. Authors of selected submissions will have the opportunity to submit their full manuscript for publication as part of an edited volume published by Rowman & Littlefield Publishers. The GIG-ARTS 2017 conference is co-Sponsored by the ECPR Standing Group on Internet and Politics, The Global Internet Governance Academic Network (GigaNet) and Rowman & Littlefield Publishers; It is supported by The French National Research Agency (ANR), The French National Center for Scientific Research (CNRS), UPMC-Sorbonne Universités, The Paris Institute for Advanced Study (Paris IAS).